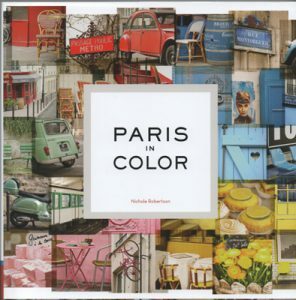 I recently received the book “Paris in Color” by photographer Nichole Robertson, and it’s a wonderful look at the City of Light through about 150 photos of Paris that are grouped by color. But Roberston doesn’t serve up the usual snapshots of iconic Paris landmarks like the Eiffel Tower, Arc de Triomphe and Notre Dame. Instead, she chronicles this gorgeous city through the everyday sights that truly give Paris its charm and beauty—a bright-yellow Metro sign, red cafe chairs, bouquets of pink roses for sale by local florists, blue bicycles parked outside a typical neighborhood boutique, the ever-present black chalkboards announcing the day’s specials at local bistros, and so on. Robertson groups her unusual photos by color: black, blue, brown, green, orange, pink, purple, red, white and yellow. For visitors to Paris, these images are delightful reminders of the beauty that surrounds you no matter where you go in the City of Light. And for those who dream of one day traveling to Paris, they’re certainly added inspiration (as if you needed more!). 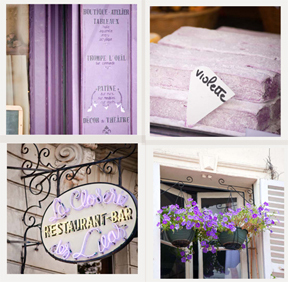 I dare you to flip through “Paris in Color” without a huge smile! 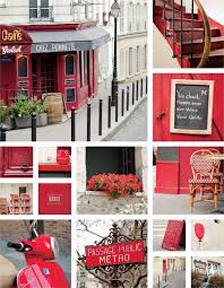 “Paris in Color,” published in 2012 by Chronicle Books, retails for $19.95 and is available at bookshops nationwide and through online booksellers like Amazon.com and BarnesandNoble.com. 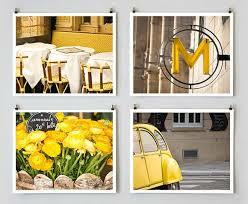 This entry was posted in Beauty of Paris, Books and tagged Paris in Color, photos of Paris by Bob Adams. Bookmark the permalink.